In the way of things here in Accra, I attended two book events back-to-back last week [sorry for not posting about them earlier – any excuse would just be that]. 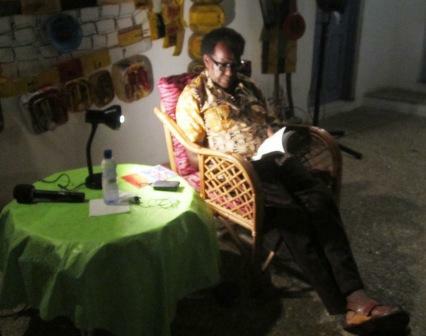 One was a set of readings at the Goethe Institut by Kojo Laing, an older Ghanaian writer who has published only a few works – under the auspices of the Writers Project of Ghana. His books are not the easiest to read, and listening to Laing’s answers to questions one could understand why. Although he grounds his work in Ghana, Ghanaian life and culture it has many fantastical elements in it. At times I almost felt like saying that he was on a rather different planet to we mortals! Plus I understood why I had struggled to read, understand and finish the three of his novels which I have read. 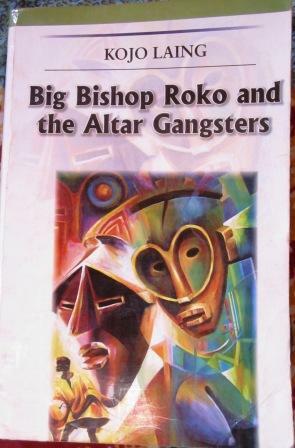 Big Bishop Roko and the altar gangsters – the only book I actually have, and of course, I forgot to bring my copy to be autographed! The other book event I attended was the launch of a huge (more than 1,600 pages!) 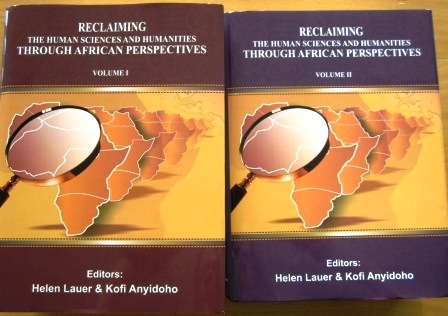 two volume work entitled Reclaiming the human sciences & humanities through African perspectives (edited by Helen Lauer and Kofi Anyidoho, and published by Sub-Saharan Publishers). This compendium of historical and contemporary essays/articles was launched at the University of Ghana, Legon, and obviously aimed at academics and senior level students. I actually arrived early, and watched as the Nketia Conference Hall at the Institute of African Studies gradually filled up. The programme more or less kept to time, but it still went on. However you count it, fifteen eight minute speeches/comments/presentations still mount up to two hours, but I suppose there were a lot of people who had to be recognized and who would be offended if they were not publicly acknowledged. There wasn’t an auction, for which I was very grateful, but there were plenty of copies of the books to be bought. I did buy a set for work, but felt that it was a bit much to purchase for my personal collection, even though it was sold at a relative discount! Interesting that both these events involved rather challenging tomes! Are we training for the 21st century? I don’t usually talk too much about work in this blog, though I do not hide the fact that I am a librarian both by occupation and profession. During the last few weeks I’ve been almost a “one-man band” or should I say “one-woman band” at work, as one of my colleagues has left for “greener pastures”. I wasn’t quite alone, as of course there were work-study students around at odd hours, and also a second set of students on practical attachment from the Department of Information Studies (DIS) at the University of Ghana, Legon. This was the second pair who had spent time with us, and I found the contrast in their attitude to their practicals to be worth comment. One of them didn’t even show up until well into day 2, and given that we had a public holiday, this meant he missed almost a quarter of the time here, but it didn’t seem to matter to him. He said he had been sick, but had not bothered to find out the phone number of his “partner” or even of the institution he was supposed to be visiting. Yet this is the same person who has worked in a library for several years, and dare I say, of whom one might have expected more? Or maybe that is precisely why he couldn’t be bothered; maybe he felt he wouldn’t learn anything new? The other person was around – more or less on time – and tried to keep in touch, if she was going to be late. Similarly she seemed to be full of questions, and comments about the lack of customer service on the part of people working in libraries in Ghana. I wondered what would happen to these two students when they left the University of Ghana – one to go back to a job, the other to find one – and what their attitudes would be in their workplaces. On a more basic level, I got the impression, as we interacted, that a lot of the curriculum and the actual teaching being done at the Diploma level in the Dept of Information Studies is quite “conservative” and dare I say, a little “old-fashioned”? I am not saying that everyone should be using PowerPoint, or talking about blogs, but I do expect that students who are ultimately going to be working in some kind of customer service environment which is likely to be dependent on ICTs should have at least heard of some of the contemporary developments. I was also surprised to hear that there is actually a course in “library automation”, which is exactly the same heading for a course which I did thirty five years ago at the University of Ibadan. Are these students really being prepared to work in a 21st century environment? In a more general way, the feedback from students actually made me wonder how much interaction there is between the Department of Information Studies and employers of their “products”. Does the Department have mechanisms in place for getting feedback on what our expectations are? on what skills we require postgraduates, graduates or diplomates to have? These could be by face-to-face interaction, hard copy questionnaires, focus groups, even group discussions. Maybe there are discussions between DIS and the Ghana Library Association? But if so, are these shared with members? Of course, curriculum design is not part of our job as an employer, but I think increasingly it is a feature of the modern world that institutions of higher education cannot exist in theoretical vacuum. What is the point of running professional courses, which are aimed at satisfying the future manpower needs of a particular profession or occupation, without an explicit consciousness that the future will be different from the present?